If I didn't remember wrongly, the 3 of us who shopped at F21 wore our new buys the next day. It's mad cold in the morning! Then the birds flew past in a formation! P.S actually I think it's quite dirty. Lots of seaweeds/sea plants/whatever it is around! Kuan Yee took this for me. While I was walking into the waters for a photo hehex. The water is super cold hahas. Random photo of the lonely bird. The two Jas taking photos with the word "Jas". So they added in a stickman to represent him hehex. Back to the car park. P.S Spot the amusement park behind! 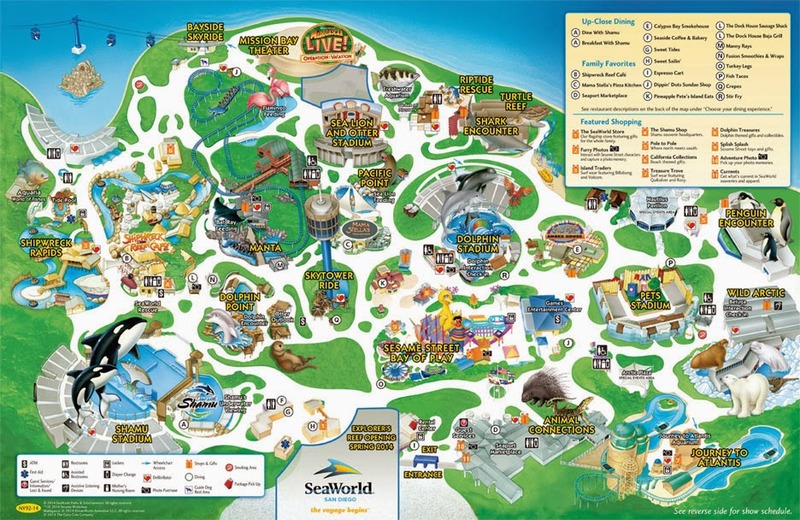 Here is the park map. First we caught the dolphin show. We didn't have any plans there. Just walked around and see what are the show timings. Next was Shamu (killer whale) show! When everyone's still dry hehex. Cause... we reached there rated late (or on time) and we sat at the wet zone hahas. Keep splashing. I sacrificed my camera to take the photos okay. Kidding. Actually I only took my camera out when I knew it wasn't gonna splash. Most of the time my camera is hidden under my jacket. Removed my jacket to cover my camera ok hahas. Good thing that I removed my jacket though. Cause my jacket ended up somewhat dry. The place is sunny but also windy at the same time. Drenched and opps my camera lens got some drops of water too! Quickly cleaned the lens after this photo else my sis will kill me for it. We all went to the restroom to dry ourselves a lil. Still quite wet but at least not soaked. Time to have a turkey leg! :) Yums! I think we had grilled corns too. Didn't take a photo of it though. Btw corns in USA are really sweet and yummy! We passed by the dolphin training/touch pool or whatever it's called. Didn't get to touch any dolphins though. They kept swimming elsewhere and the place was too crowded. Next up, a roller coaster ride! Yay! They have this bat ray feeding area there too. I think that's where we touched the stingrays and starfishes! It's those usual round water ride like the one in USS. And yes we got wetter than before. And I came to realize one thing. My dress is sort of water proof LOL! Water can soak up the dress but not much water will flow to touch my skin. Either the dress is waterproof or super absorbent lols. Passed by but didn't enter. I suppose there are fishes in there? Next, an aerobic + water show. I have no idea what is this show called. I have no idea why I took this photo HAHAHAS! Baby shark pool. If I didn't remember wrongly, you can touch the sharks there! Speaking of touch pool, we went to touch stingray and starfishes too! Didn't take a photo though. They have a touch pool somewhere in the park. Hello shark and two fishes. Had my jacket over me right after the show. We were still wet but when the wind blows, it's really cold! A group photo with the shark teeth. As you can see, my camera was in my hand. Photo stolen from Weida hahas. Sea Lion show, mainly sea lion, the otter only pops out here and there in the show. Anyways they are super smart okay! The Sea Lions can dance!!! Here you can see all sorts of penguins! Here they have different types of animals that live in the cold. P.S Strangely polar bears are always sleeping regardless of which zoo/park we visit! Well... we decided not to take another water ride cause we were somewhat dry already! That's actually all that we did at the park! I was typing halfway and wanted to say "We didn't take the sky tower ride, not sure why"
And I realized that I walked passed the sky tower ride without knowing that it's a ride LOL. Maybe that's why we all didn't take that ride? Or was I the only one who didn't know it's a ride? Opps. Anyways I don't think there's much to see up there too. Prolly just the skyline of Seaworld San Diego? Weida brought us to The Old Spaghetti Factory to eat! We saw a pinkberry outlet there! Actually we saw it while we were walking there hahahas. After that we drove all the way back to LA! So we reached LA on a saturday night and sunday became a slack day hahas.